Chapter 5 introduces SOA composite applications. In this chapter, some of same services discussed in chapters 3 and 4 using Service Bus are implemented again, as SOA composite application, using Mediator and many of the same supporting resources (WSDL, XSD, XSLT, Adapters). This figure visualizes the components implemented in this chapter – one SOA composite application and one Service Bus project that virtualizes that application. 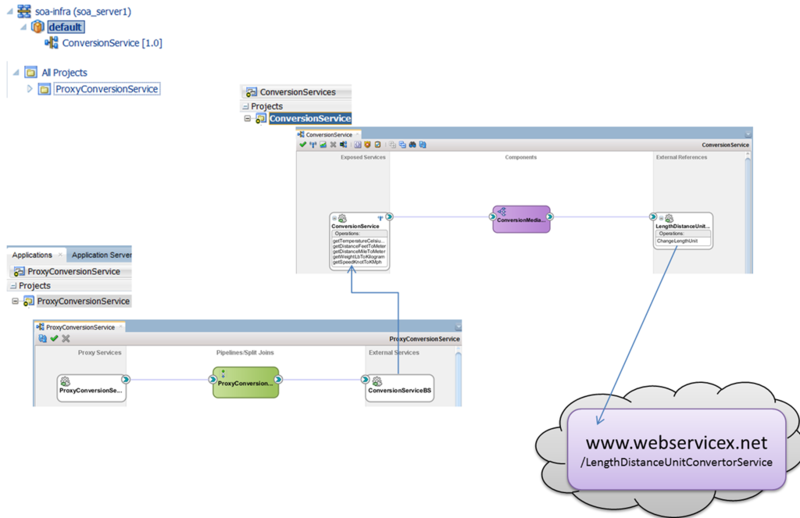 The SOA composite contains a Mediator and implements multiple operations, one with a local Echo + Transformation and another using a Reference Binding to an external web service. The Service Bus project provides virtualization of the SOA composite. Sources for Chapter 5 are on GitHub: Sources Chapter 5.